Qualifications: Diploma in Violin(Dist. ), BA in Composition, Ex member Symphony Orchestra Thessaloniki(Greece) and Brussels Youth Intern.Orch. 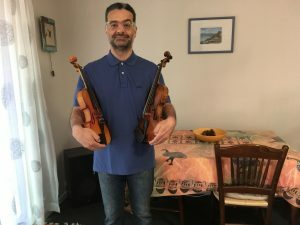 From my home in The Gap or at your residence, I offer individual violin lessons to students from age 8 to adult, and from beginner to advanced. Teaching and performing for almost 25 years, I have tutored many students for auditions and exams. I have extensive experience with teaching approaches in Europe and Australia. I enjoy adapting lessons to the interests, experience and level of each student and learning from them. In my lessons, I can cover music theory and accompany violin with my violin or my piano. My favourite quote is “LEARNING TO PLAY TOGETHER”.